In October of 2010 we were approached by Wichita Festivals, Inc. to create an event for RiverFest 2011. We could choose any type of event we wanted. How could we resist?!?!? We were working on bike racks to encourage biking in Delano so we decided to do an event focused on cycling. 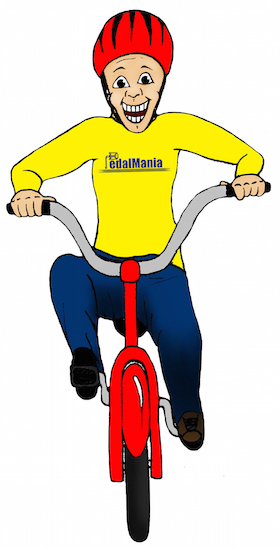 Along with the Coasters, the Oz Bicycle Club and several area bike shops, we came up with Pedal Mania! 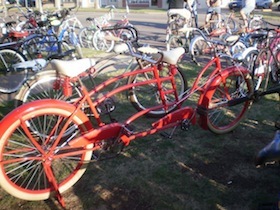 The event had both long & short family rides, a scavenger hunt, a bicycle show and several bicycle games. In June we were informed that Phase I of the bicycle racks were to be installed in the next 30 - 60 days. What to do... can you guess? True to our trend, we decide to throw a party!!! The City was willing to do a Ribbon Cutting but we wanted to do something more. After all we had been working on this for over a year. We wanted to celebrate! 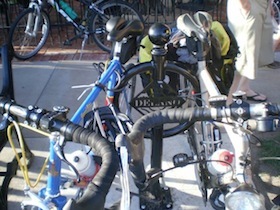 The Ribbon Cutting & Bicycle Block Party was scheduled on a Thursday night to tie into the Thursday Night Pub Pedal held by the Coasters starting at the Shamrock Lounge. The Shamrock is at the west end of the area (where one of the racks had been installed) so after the ribbon cutting at the Clock Tower there was a bicycle procession down to the Shamrock, followed by a Bicycle Block Party. 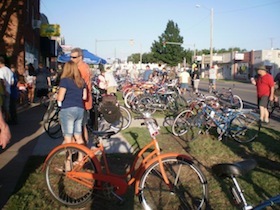 There was music, food, entertainment and bicycle fun. The Delano CDC sold hot dogs, chips, drinks and desserts. Amira's dancers were there along with the Coasters members and many other bicycle enthusiasts. 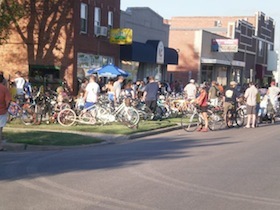 Many people suggested it become an annual event and we wanted an event at the west end so the Bicycle Block Party is now scheduled for the last Thursday in August. This will be a great end-of-summer party! Christmas in Delano has become one of our most well-attended events.